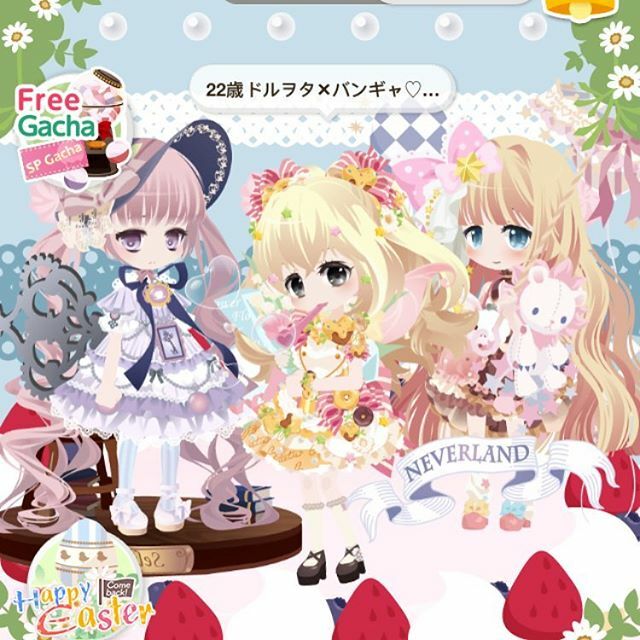 Concept: 7/10 The concept of CocoPPaPlay is simple – play “gacha” machines or enter monthly events to win new outfits. Outfits consist of different layers, such as eyes(facial expresion), hair, clothes, shoes, hand accessories (purses, stuffed toys, swords, etc), hats, glasses, pets, backgrounds, and other items – This allows you to really fine-tune and make unique avatars. Similar to games like Pokemini (which I reviewed here) or Line Play (review coming soon). However, in my opinion, CocoPPaPlay has less robust features than these two games and operates on more of a pay-to-win model than either of the above games. Gameplay: 7/10 I covered the basics above: There are a number of “lottery” style games (gacha machines) where you’re awarded an item for your outfit by paying or using a gacha ticket. Gacha tickets only work in a few gacha. Once a week you can use in-game currency (the free kind that you earn by playing) to play one Gacha. This resets on Sundays, so each Sunday, you could, in theory, get a free “paid” item. The problem however, is that it’s insanely expensive. You earn this free currency by “cheering” for people’s “fashion shows”. The problem is, the gacha cost 20,000 of this free currency and you only get 5 to 10 of the currency for each cheer you do. You’d have to cheer 2,000 – 4,000 times to get enough points to get a free item each week – this is insanely time consuming. To give you an idea, I played it very heavily this past weekend, logging in about once an hour and using up all of my “energy” cheering – which took about 15-20 minutes each hour. I did this each hour from about 9am – 11pm each day Saturday and Sunday – and only earned around 8,000 “smile points” (the in-game, free currency). You’d have to keep this pace up for 4-5 days, without missing a day or hour/wasting your free energy refills, etc. – I also had some free “energy drinks” and since I started a new character (didn’t feel like digging out my ipad to transfer my data), I leveled up many, many, many times from level 1 to 24 within the 2 days, and each time you level up, your energy also refills – so I cheered lots and lots – but obviously, not even close to the amount needed to get to 20,000 smile points!! I work (as I’m sure a lot of my readers do) so I can’t log in Monday-Friday. So realistically I can only play on weekends – which means I’ll probably take 2-3 weeks to reach the 20,000 smile points necessary. Other games, like Moe can Change and Animal Boyfriend (which I reviewed here) let you play EVERY gacha for free completely free one time – so you always have nice items! I don’t like that CocoPPaPlay forces you to feel like you HAVE to spend money – I spent money willingly one time in Moe can change to get a hairstyle I wanted – but I have thousands of cute clothes for free. Every game should let you get free stuff – Line Play’s gacha’s only cost one to three thousand gems not 20,000!! Making it much easier to earn tickets on the Gacha. I just feel that CocoPPaPlay is greedy in this regard. Also, let it be known, that they don’t even make their own graphics, they use some type of “free to use” avatar system called “Selphie” which is used by A TON of other games (sadly none in English). There used to be a game called Tinier Me which was in English however, it went out of business some years ago. The “Japanese Tinier Me” still exists as “AtGames” and their “free items” are MUCH nicer than those in CocoPPaPlay which only puts like the worst garbage items in their “shops” For example, in the Japanese Tinier Me (or AtGames) you can get very nice high quality eyes for free/or in game currency. While in CocoPPaPlay you only get “closed eyes” like “n_n” and “^-^” and “x_x” etc for free. I only have 2 models on my new account right now because I’m still trying to win a face for my third model in the Gachas. And that’s another thing, although at level 10 you can dressup 3 characters at once, you can only use an item in your inventory once and can’t reuse it on another model unless you “unequip” it first. Just more evidence of wanting you to pay to play – they could have a default face that you could use/start with but nope. Okay so I’m done ranting about the pay-to-win gamestyle – let’s move on to some other things now. There are numerous events – most recently they had an Easter event – but basically every event is the same – there will be multiple “quest givers” who request items from you – these items you can earn for free by cheering – you get “lucky tickets” in exchange (and sometimes other items like exclusive limited outfits, energy drinks, etc) – The lucky tickets can be used to try to play the lucky event gacha to win outfits/energy drinks, and/or used to raise your charm level for the event – I recommend trying to max your charm (similar to the events in Dream Girlfriend (which I reviewed here) having high charm lets you get event points and rewards much quicker! Therefore its best to max it out asap). To illustrate, I ranked in the top 5,000 (which is pretty low but in the scheme of things, with 40 million players according to their itunes profile, not bad) within just 2 days of playing, on a brand new account, at the very end of an event. So it’s fairly easy to rank – I think maybe a lot of that “40 million” is inactive or like me, hadn’t logged in in a long time, etc. Either way, it seems most don’t go for the event items, and/or don’t make good use of the charm boost, etc. There’s a farming minigame, but it’s pretty lame, you sheer sheep. I dunno, I don’t find it that fun, you earn “wool points” and outfits when you discover a new sheep. You discover new sheep by spending wool points to improve your farm and buy new equipment to care for your sheep. You also can take on quests from NPCs within the game, which when you complete, will add new items to their shops, and unlock new cities to explore, and grant you some free outfits. When a city “levels up” they have a sale with half priced items – but I never buy them – because I’m hoarding all my Smile Points to use in the “weekly free gacha”. Customization – 10/10 – going on 2 years (they’re having a 2nd anniversary event right now) – the number of items available is incredible, and many items have already retired, rising the demand (unfortunately there’s no trading system (which exists by the way in the Japanese Tinier me lol)) – you get “bragging rights” if you have a super rare/old/obscure item equipped and well, I see this game being around 2-3 years from now, so even if you start playing today, in 2-3 years you too will have those rare items everyone else wants and be admired. I like games like this where they retire items fairly quickly. Pokemini is another example of really time sensitive items. That to me really increases my drive to play these games. Story: 2/10 – There’s really not much, if any, story – I think there was some type of story presented at the beginning, but it’s so bare bones I forgot it quickly. It’s mostly fetch quests and cheering and there’s also quite a few typos or improper grammar and awkward sentences thrown about in the game. Characters: 6/10 – Characters get high marks for cuteness – but really have no purpose or substance, other than serving as mascots. Graphics: 10/10 This game is super cute, the mascot girl who guides you through the story and quests is adorable, and the sheep mascot is also cute and he helps run your club. Your avatar and the items are very nicely drawn and large. a Good variety of items (though most are paid items) and different poses, and the ability to layer many items to create your avatar make this game very very appealing for anyone who loves cute things. Replay Value: 8/10 – It gets repetitive, is super time consuming, and annoyingly “expensive” – but in the end, the lure of those time sensitive items keeps you wanting to press on to replay and get new items. It’s a very item-centric game. Is Releasing Unfinished Games Becoming the New Industry Standard? Pingback: Miitomo Review: Nintendo's New App Will Devour Your Soul -- And All of Your Free Time!